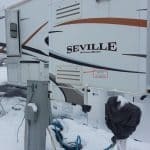 Winter RV Furnace Failure... or not?? Even when my furnace failed to produce warm air on January 23, I realized there was an important difference between the two prior failures. The last two failures occurred when temperatures were well below zero, the first time it was -28F! When extreme cold occurs, the furnace has to run nearly continuously and then cycles with a very brief downtime. This is far from optimal for the health of the furnace. 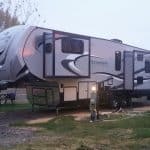 More details can be studied in THIS POST about RV furnaces and their operation. This time, it was “mild” (25F) and the furnace was behaving differently – it was “trying” to fire up. The end result? As soon as the snow and ice was cleared – the furnace returned to life! 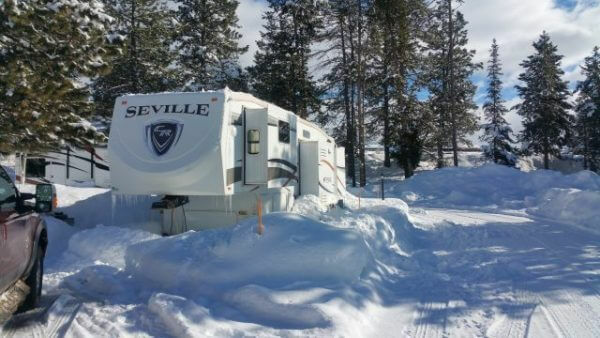 Winter in McCall is most definitely picturesque – but – it can create challenges for your RV Furnace! I mentioned in my video above about a roof rake I bought and have used extensively this winter. Click the image below to access the rake – and get the best price via Amazon. I should note it is NOT the cheapest rake available, but comes highly recommended and has not broken even with many uses this winter by myself AND my neighbors! So, it looks like I dodged a bullet (this time)! 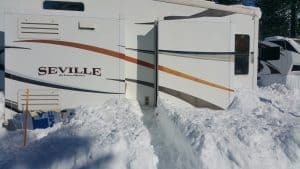 Simply clearing the snow and ice away from the RV furnace vents, it fired right up – and allowed me to (kind of) get back to sleep since my shoveling project was undertaken at 3:30am and required 45 minutes! As to the remainder of the winter, it may be too early to “make the call”, but I suspect the snow depth outside now is the maximum we’ll see all winter. The next 6 days are expected to be relatively dry (and sunny!) And while February and March can bring LOTS of snow (and the skiing at Brundage is PHENOMENAL right now), temperatures begin to rise and the sun itself, even on cold days will begin to take a bite out of the snowpack – especially in the latter half of February. Gotta keep the RV furnace vents clear in the winter! As you can see, my fifth wheel is not going anywhere anytime soon! 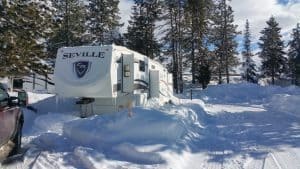 If you are a “winter RVer” or ever plan to RV in the cold, I maintain an entire section of RV Across America that is dedicated to Winter RV’ing. Please do subscribe to our newsletter above – we will never sell your info or overload your email inbox! Just found your site a appreciate your thoughts and comments. 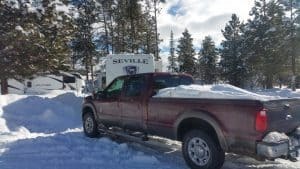 We spent last winter in Breckenridge and are traveling around to different ski areas this winter. Sun Valley, Grand Tarheel and Jackson Hole so far. We have a 35′ class a and primarily rely on electric heat devices in the living area and in the bay that houses our water lines. Below we have a couples of 200 watt personal heaters with on at 35 off at 45 thermostats that do a pretty good job of keeping things flowing. Looking forward to your post on ski areas with open trailer parks.